I don't like how iOS devices can't preview the contents of an iTunes link for a Mac App Store app (shown in the screenshot above on the left). While I (partially) understand the limitation from an infrastructure standpoint, I still think "incompatible" App Store pages should at least display text, screenshots, and a link back to the developer's website without a Buy button. 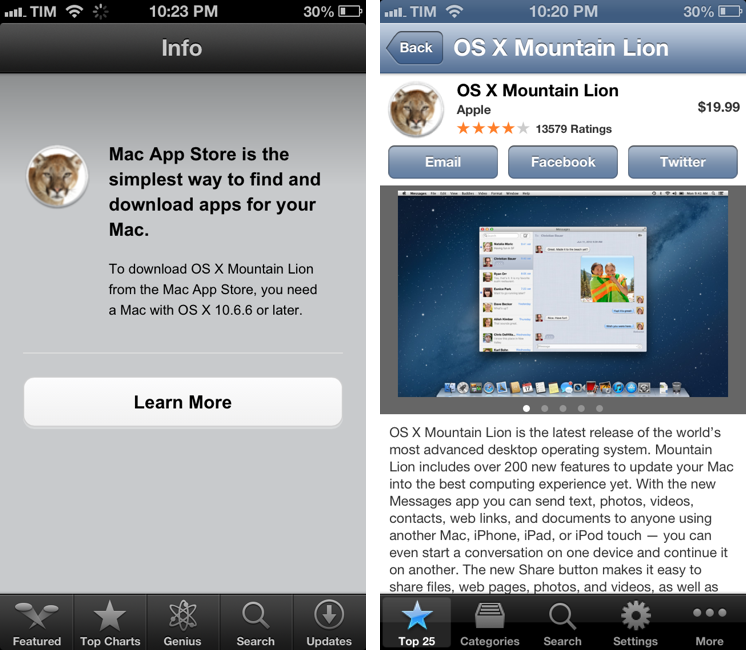 There are solutions to preview a Mac App Store link on iOS. As far as browsers go, you can "Request Desktop Site" in Chrome for iOS and choose a different user agent in iCab Mobile (my two favorite third-party browsers). Chrome is my go-to browser these days, and I like how the feature is limited to single tabs, rather than the entire app. Thanks to @AppleSpotlight, I've also found a non-browser app to achieve the same functionality and also a bit more. Desktop Apps lets you browse the Mac App Store from an iPhone or iPad (the app is Universal and free with ads). You can view the Top Free/Paid/Grossing apps, categories, and you can search for a specific app. You can open an app's page, view screenshots, share a link via Email, Twitter, or Facebook (with native iOS integration), and even select text displayed as a description. Unfortunately, the app doesn't fetch additional information like Developer Website, ratings and reviews, and there's no URL scheme to easily turn itunes.apple.com links into URLs for the app (like Documents does for Safari). Desktop Apps' graphics aren't entirely Retina-ready: the app is optimized for the iPhone 5, and two out of five tab bar icons are Retina-ready, but three of them aren't -- just like the icons of the Mac App Store apps. It's a strange mix of fuzzy and crisp graphics. Desktop Apps has a $0.99 in-app purchase to remove ads; if you're really into the idea of browsing the Mac App Store from iOS, go ahead and unlock it. Otherwise, I think you'll be fine using the free version alongside Google Chrome.